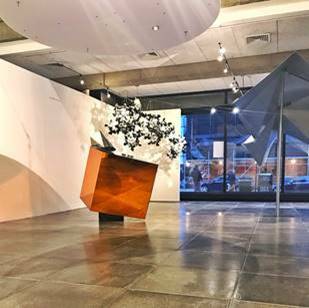 Metamaquettes: Between the Lab and the Site, a solo exhibition by Zenovia Toloudi DDes ’11, is on view through February 28, 2019, at McCormick Gallery at Boston Architectural College. The exhibition explores subjective perceptions of space and user engagement through a body of works that includes installations, models, and mock-ups. “Metamaquettes invite us to investigate subjectivity, neglected notions about sensory experiences, communal habits, and the ordinary and vernacular elements of culture,” states to the exhibition website. Toloudi will deliver a public lecture at the BAC, followed by a gallery reception, on Wednesday, February 20, at 6:00 pm. Toloudi is an architect, artist, and assistant professor of Architecture at Studio Art, Dartmouth College. Her work critiques the contemporary alienation of humans from nature and sociability in architecture and in public space, and investigates spatial typologies to reestablish cohabitation, inclusion, and participation through digital, physical, and organic media. The founder of Studio Z, a creative research practice on art, architecture, and urbanism, Zenovia has exhibited internationally, including at the Biennale in Venice, the Center for Architecture, the Athens Byzantine Museum, the Thessaloniki Biennale of Contemporary Art and the Onassis Cultural Center. She has won commissions from Illuminus Boston, The Lab at Harvard, and the Leslie Center for Humanities at Dartmouth. Zenovia’s work belongs to permanent collections at Aristotle University (AUTh) and the Thracian Pinacotheca. Her essays have been published in Routledge, Technoetic Arts, and MAS Context. Zenovia is the recipient of The Class of 1962 Fellowship. She was a Public Voices Fellow; a Research Fellow at Art, Culture, and Technology Program at MIT; and a Fulbright Fellow. Zenovia received her Doctor of Design degree from Harvard’s GSD (2011), a Master of Architecture degree as a Fulbright Fellow at the Illinois Institute of Technology (2006), and in 2003, she graduated from the AUTh in Architectural Engineering. The exhibition is free and open to the public. Learn more.